Kofax TotalAgility® is the world’s first unified smart process application development and deployment platform. It provides an essential link between an organization’s “systems of engagement” and “systems of record” to help increase responsiveness to customers, improve service levels and gain competitive advantage in order to better manage and grow businesses while greatly reducing operating costs. Enabling Kofax customers to accept invoices through paper, fax, email, EDI, XML and mobile channels, delivering high quality digital images for use throughout AP processing. It also Documents drive critical business interactions such as human resources and finance processes, sales orders, new customer account applications, service requests and contract renewals. Also crucial to these interactions are the people involved, such as the supplier or accounts payable processor. The human aspect of the interaction is where efficiency and opportunity are often lost. Improving the quality and speed of these interactions is key to the achievement of service level targets and other shared service center objectives. Kofax TotalAgility delivers benefits at every stage of the end-to-end AP process, digitizing inbound invoices, intelligently extracting invoice information for automatic processing, integrating to ERP systems and providing visibility, control and mobility throughout. Providing flexible and scalable document capture that supports the processing of any document type captured at any point in a business process, and from any input device (mobile devices, desktop scanners, MFPs or high volume production scanners). Transforming business documents into structured electronic information extracted, irrespective of document type, including handprinted and handwritten forms, invoices, checks, new account applications, service requests, correspondence, etc. Increasing the productivity of workers as they quickly process inbound documents and efficiently deal with exceptions, trailing document requests, etc. Engaging responsively with employees, customers and partners during inbound and outbound communication, exploiting virtually any device type (smartphones, tablets, web browser pages, MFPs, etc.) and media type (paper, email, fax, SMS, etc.). Providing real-time performance monitoring and metrics on the operational health of the shared services operation, and actionable analytics that drive performance improvement. Integrating with a wide range of in-house and third party systems and applications, including ERP, SCM, CRM, records management and archival applications. Incorporating a scalable platform that can meet the needs of small/medium business units and the complex requirements of high volume, mission critical processes; this includes scaling from hundreds to millions of documents per day and operating in both centralized and highly distributed environments. Delivering high availability and disaster recovery for mission critical implementations. Incorporating eSignature capabilities to deliver completely digital processes. Optimized Smart Process Management. Improves performance of routine, dynamic and collaborative business processes to increase efficiency, cut process latency, streamline document processing and enhance the customer experience. Versatile Mobile Services. Leverages today’s ubiquitous mobile devices to reduce process latency and provide customers with ease of use, quick response times, and the empowerment they expect. Robust Capture Services. Kofax TotalAgility® provides full multi-channel capture capabilities that enable organizations to digitize paper for archive, compliance and business process automation purposes. Information Transformation Services. Provides better access to document-based information in digital, process-ready format by classifying, separating, extracting, and validating content from structured, semi structured and/or unstructured documents for faster, more accurate processing at a lower cost. Insightful Business Intelligence and Analytics. Provides near real-time analytics of content and process data which helps businesses make informed, effective decisions sooner, as well as providing valuable insight to optimize processes. Flexible Data Integration Services. TotalAgility offers a variety of pre-built connectors, web services and synthetic API methods which enable organizations to quickly and efficiently create integrations to external parties and in-house systems of record. Customer communication management. Close the customer engagement loop quickly and effectively by generating relevant digital or paper correspondence that creates value in streamlined customer engagements. eSignature management. Reduce latency in signature-dependent business processes while maintaining compliance with regulation and procedure. Multiple Deployment Models. To meet our customers’ cost, flexibility and time-to-market needs, TotalAgility can be deployed as a perpetual license on premise or as a multi-tenant or dedicated instance hosted SaaS subscription service. Simplified Pricing and Licensing. Kofax otalAgility offers a simple pricing and licensing approach that helps the ease and speed of adoption and scales with value received. Kofax TotalAgility delivers a unique combination of capabilities unified in an open technical architecture. Allows any document from any source to be ingested into and understood by a business process - automatically. Supported capture sources include TWAIN and ISIS scanners, mobile and tablet devices, MFPs, email, fax, watched folders, and web services. 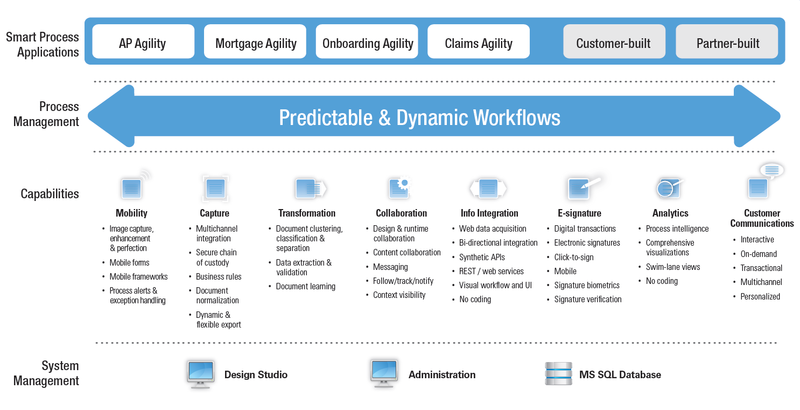 Integrates people, systems and business policies to add momentum, streamline workflows and increase process visibility. Provides near real-time analytics of process, content and business data, which helps businesses make informed, effective decisions sooner, as well as providing valuable insight to optimize processes. Is supported as a primary channel in an omnichannel engagement capability, allowing your business processes to extend literally into the hands of individual customers, partners, suppliers and employees while also supporting other digital and physical channels. Grabs information from websites, portals and virtually any hard to reach data source and automatically pulls it into your business process when you need it. This eliminates the people-intensive, manual integration still in place in many organizations. Accelerates engagement by delivering low-latency, two-way, omnichannel customer communication that’s faster, more targeted and less expensive. Makes crucial agreements possible faster while allowing customers the flexibility to use any signature format they wish. Financial Services. Customer onboarding or account openings; Investment account transfers; Mortgage & loan applications; Trailing documents. Insurance. Customer onboarding or account openings; New policy quotes; Claim submissions; Trailing docUments. Healthcare. New patient onboarding; Claim submissions; Explanation of benefits; Trailing documents. Government. Citizen benefit enrollments; Claim submissions; License & permit applications & renewals; Trailing documents. Supply Chain. Accounts payable automation (invoices, purchase, requisitions, receiving documents), orders, prof of delivery. Other Industries. Business process outsourcing; Industrial & energy; Utilities; Telecom. Kofax TotalAgility provides a uniquely comprehensive set of capabilities in a modern, open architecture, allowing customers to benefit from the platform at a pace that meets their need and via solutions that comfortably sit alongside existing technology investments. Kofax TotalAgility reduces error-prone manual processing and latency while improving customer satisfaction, competitive positioning and profitability. By delivering responsive, dynamic business processes that maximize self-service models, Kofax TotalAgility improves responsiveness and enhances customer experience and engagement. Kofax TotalAgility extends smart process interactions, HTML 5 interfaces and information capture capabilities to any mobile device, to improve collaboration and reduce time and cost from information-intensive business processes. By integrating easily with existing systems of record, Kofax TotalAgility delivers better First Mile processes without the need for labor- and cost-intensive modifications to legacy applications. Unmatched Invoice Processing Efficiency. Without parallel in the industry, we efficiently digitize invoices and other documents from any source, accurately extract critical business information from them and automatically verify against master data records of supplier/vendor, PO, receipt and GL account information. Outstanding AP Workflow Productivity, Visibility and Control. Visibility and Control: Kofax TotalAgility Accounts Payable Automation streamlines workflow better, enforces business controls more effectively, provides clear and actionable visibility of AP performance, and drives continuous process improvement more quickly than any other provider. Recognized AP Market Leadership. Over 1,000 organizations worldwide rely on Kofax’s products and expertise to drive invoicing and AP excellence. Kofax’s 400+ experienced AP professionals are regularly cited by customers as critical to their decision to choose Kofax. TotalAgility provides a modern, open architecture and is specifically designed to give organizations the flexibility to deploy either on premise or in the cloud. Off-the-Shelf Flexible Integration: TotalAgility offers a variety of pre-built connectors, web services and synthetic API methods that allow customers to accelerate implementation of their solution and leverage and extend their existing software assets. Kofax TotalAgility Designer is an easy-to-use visual environment for modeling, design, analysis, simulation and testing of business-critical customer engagement processes. Control and compliance goals can be met by designing processes to ensure enforcement of policy, procedure and regulation. Business agility goals can be met by enabling process flexibility at execution time, so key interactions can be orchestrated while processes are “in-flight”. The Kofax TotalAgility Workspace delivers the right work to the right person at the right time, enabling people to engage in process execution in a manner appropriate to their role. Process participants work efficiently, effectively, intelligently and transparently, and can participate in process improvement as they innovate daily with customers, partners and others. Kofax TotalAgility enables manual and automatic intervention to in-flight business processes to quickly adapt to changing circumstances. Kofax TotalAgility can react to events and changes in context, throughput, capacity and workload. As exceptions occur or case-by-case differences in requirement must be handled, Kofax TotalAgility can automatically respond with new processes and/or empower knowledge workers to intervene productively. Kofax TotalAgility enables shared service centers to reduce the cost of provision while improving customer satisfaction. Kofax TotalAgility processes virtually any structured or unstructured document type using the most complete set of document classification and information extraction technologies available today. The critical interactions between document submitters, processing staff, case workers, and others are streamlined, cutting latency from the process and improving responsiveness to the employee, customer or partner. And Kofax TotalAgility supports continual reduction in the costs of servicing through built-in, multi-tenant management and other features. Integration with over 140 third party systems, including ECM and ERP, is supported and continually upgraded so the provider’s investment is future proofed. In a single, unified product, TotalAgility delivers capabilities only otherwise available through expensive integration of separate capture, BPM, case management, business intelligence and integration products. Financial, HR, CRM, mailroom, procurement, claims and contracts, etc. Avoid the trap of standardized processes that fail to meet requirements with an inappropriate “one-size-fits-all” service. Efficiently provide tenant-by-tenant customization while preserving the integrity of shared process components. Gain competitive advantage over those who can only offer a “one-size-fits-all” process solution. Use the Kofax TotalAgility tenant management system to gain flexibility in the packaging and provisioning of services. Provide usage and servicing reports that support accountability for SLA achievement and charge-backs to internal customers. From any device—mobile phone, tablet, multi-function printer (MFP), web browser page, etc. Any capture mode—batch, production, ad-hoc, point-of-service, application specific. Any point in the process – beginning, middle and conclusion. Ability to route among multiple processing centers. Capacity for millions of documents and customer interactions. Easy integration with over 140 enterprise systems. Flexible integration with proprietary and third party systems. Delivery of process ready data to workflows, CRM, ERP and relevant line of business (LoB) systems. Automated capture of data from any format, centralized and distributed. Automated extraction of business data from structured and unstructured documents. Secure permission-based workflows with audit logging, process control and “who did what when” transparency. Monitoring, reporting and actionable analytics. Automated enforcement of in-house policy and external regulatory requirements. Kofax provides multilingual sales and service organizations in 75 countries. Kofax ensures that everyone involved in validation and approval participates securely and efficiently. We’ll even engage busy managers on their mobile device of choice to approve invoices or resolve issues that arise. Throughout the AP process Kofax TotalAgility Accounts Payable Automation integrates with your ERP to accelerate secure and accurate processing. We validate invoices against ERP supplier and PO information, we ensure GL Coding concurs with your ERP and we ensure correct invoice posting. Our built-in ERP Integration Framework allows you to quickly implement Kofax TotalAgility Accounts Payable Automation to whatever ERP you use, so your AP process works seamlessly in your current business and technical environment. Gain visibility and insight to every stage of your AP process, from capture and transformation; through validation, approval and posting. Use historical data to improve future processing; take manual or rules based actions, such as approval or escalation based on near real-time feedback; leverage historical and current data to optimize performance and manage spend. TotalAgility solves the First Mile™ challenge of effectively processing the real-time, information-rich interactions involved in any customer journey. Kofax TotalAgility transforms and simplifies the interactions between that customer and anyone else involved in helping him or her to open a new account, finalize an insurance claim, resolve a reported incident–any First Mile business process. Kofax TotalAgility provides an essential link between systems of engagement and systems of record to help increase responsiveness to customers, improve service levels to gain competitive advantage, and better manage and grow business while simultaneously reducing operating costs. Kofax TotalAgility enables the transformation from physical to digital interactions in any key business process. By delivering fully digital customer engagement interactions anytime, on any device, from virtually anywhere, TotalAgility accelerates business processes, cuts costs and increases customer satisfaction. Kofax TotalAgility optimizes the connection between systems of engagement and systems of record as information collected from the customer or supplier, third party services, and internal systems can be “straight-through” processed accurately and automatically, or presented to knowledge workers in an integrated way to streamline human decision making. Kofax TotalAgility engages customers and others on their mobile devices. TotalAgility puts mobiles to work for information capture, process status, confirmations, task execution, approvals, exception resolutions, obtaining trailing documents, and any critical interaction. Kofax TotalAgility leverages the power of Kofax Insight™ to provide near real-time content and process data analytics for faster, more informed decisions and faster process optimization. It empowers workers to instantly change an in-flight process without IT assistance, for better, faster service. Kofax TotalAgility leverages Kofax SignDoc® to remove the need for “wet signatures” – reducing latency in signature-dependent business processes while maintaining compliance to regulation and procedure. Kofax TotalAgility offers a variety of pre-built connector and web services, which allow customers to accelerate the implementation of their solution and to leverage and extend their existing software assets. It also utilizes the Robotic Process Automation power of Kofax Kapow™ to automatically grab information from websites, portals and other hard to reach data sources into your business process when you need it. This eliminates the people-intensive, manual integration still in place in many organizations. Kofax TotalAgility was designed to embrace and fully exploit the cloud computing model. The platform is available in a comprehensive set of licensing and deployment models, including perpetual on-premise licenses, and multi-tenant or dedicated instance hosted SaaS subscription services. TotalAgility Cloud Service is a SaaS subscription service offering a highly scalable architecture environment for organizations who prefer cloud implementation. Kofax TotalAgility increases the efficiency and responsiveness of information-intensive business processes. It provides distinctive combination of capabilities that uniquely are pre-integrated so our customers deliver better experiences to their customers while reducing their costs of operation and distinguishing themselves from competitors. With Kofax TotalAgility, organizations respond faster to customers, increase employee productivity for more agile, flexible and competitive environments. Organizations face new challenges in meeting the expectations of today’s customers. The backbone “systems of record” that run most businesses were not designed to provide the high level of interactive self-service, speed, mobility, awareness, collaboration and adaptability necessary to successfully engage today’s always-connected, fastmoving customer. To stay competitive, organizations must now engage their customers in the manner they prefer. 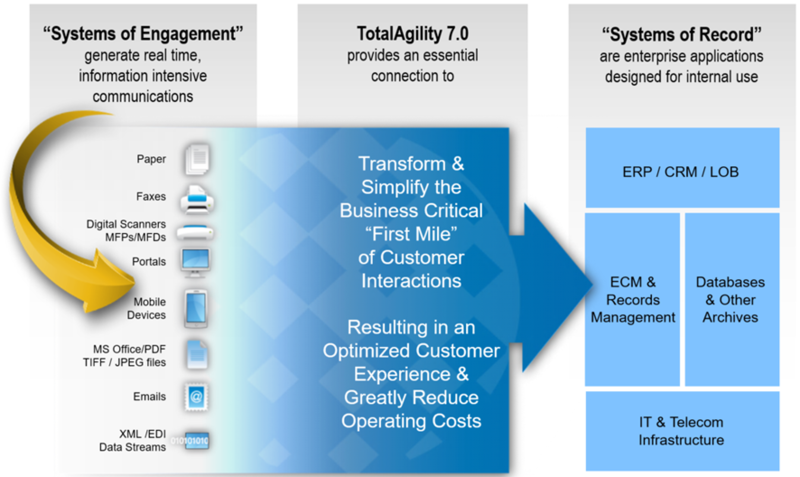 Kofax TotalAgility® enables organizations to meet these challenges by providing an essential link between enterprise applications and repositories and “systems of engagement” – the ways customers connect with organizations, including the preferred mobile, SMS, internet portal, email, web and social channels, as well as fax and paper-based communications. Kofax TotalAgility is a unified, enterprise-scale software platform that dramatically transforms and simplifies high-priority, informationintensive interactions with customers, providers or partners — interactions like new customer onboarding, claims processing, patient experience, student transcript processing and citizen services. The result is sustainable competitive advantage, continually reduced operating costs and satisfied, loyal customers. Contact us for more information regarding Kofax TotalAgility.